Probably her best configuration! Nice model! Actually I produce and sell 3d printed models only in 1250 scale. This is first test print of PORTLAND. Is there a source for this and/or others in this or other scales? 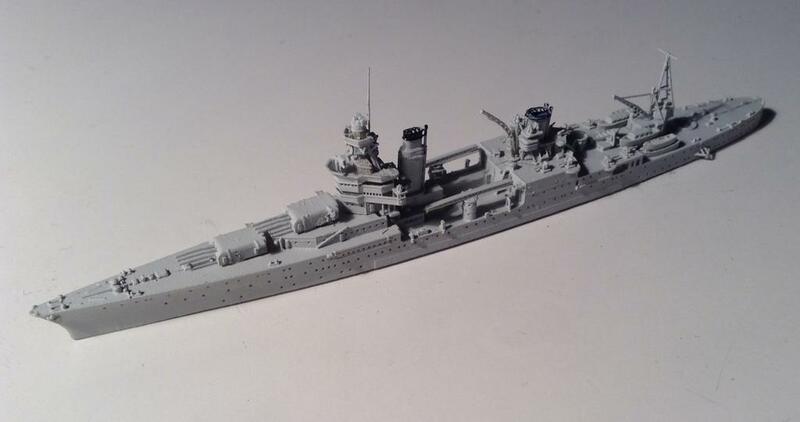 This is CA35 Indianapolis in prewar configuration. 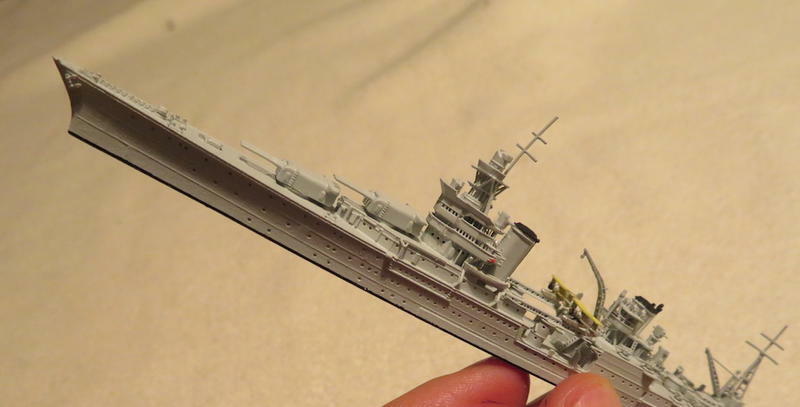 It is a done by 3d-printing in 1/1250 scale. 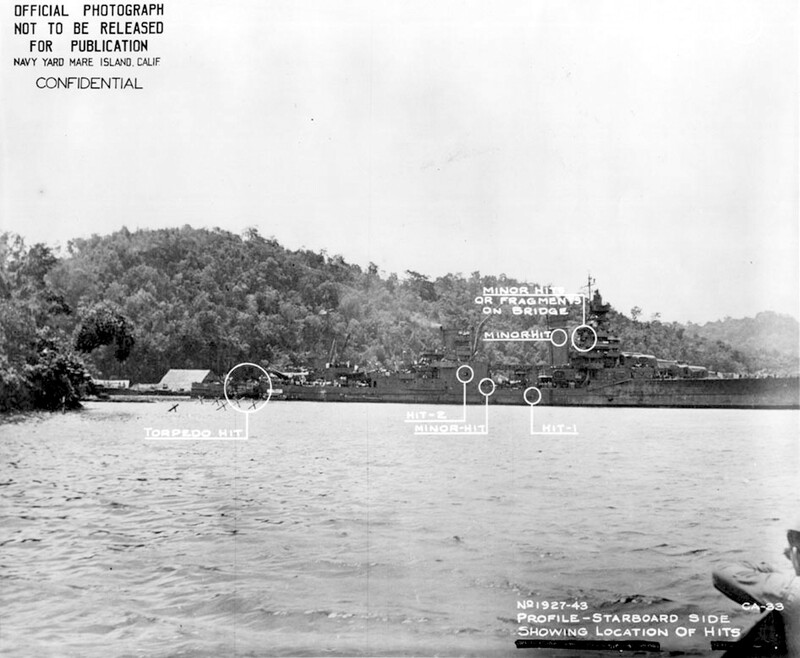 One of the ironies of the Nov 13th battle was that the two flagships were the only two cruisers in the US formation that lacked the SG radar. Portland had accompanied Enterprise back to Pearl after Eastern Solomons. That was when the SG was installed on the foremast and the FD sets (the starboard one of which was noted in the linked action report as not working properly since installation) on the MK-33 directors. Perhaps the lack of reference to her SG contacts was related to the lack of experience with it on the part of the crew. The SG set is still visible in the Cockatoo drydock photo. As a post script, the air search set she carried then was in the SC series rather than SA. Some action reports list it as an SC-1. Well no denying that, can't find mention of when it was installed. I did notice that Terzibaschitsch has her having one there in his Cruiser book, Profile Morskie also has one there but I generally question their accuracy. I have a slightly higher resolution copy of the distance shot of the Portland and included a crop. You see something there, what it is is not definite but evidence would lead us to believe it would be an SG. 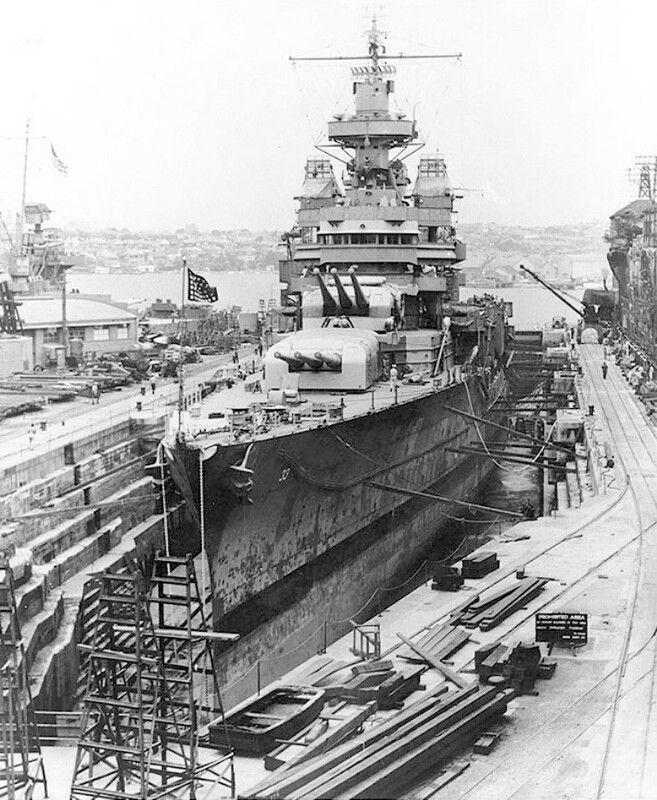 I felt it would interfere with the SA in that location, but that is where the Indy got hers installed in December of 42 and looking at Fletcher's installation we see a similar set up. I think the Cockatoo picture shows the platform but the radar was probably removed as it is not clear to me there. Good catch! 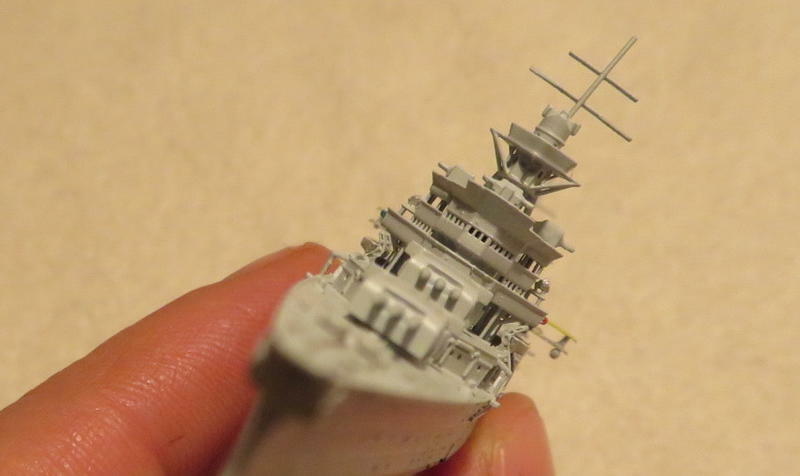 Never noticed that info and I am slowly working on my 1/350 Sweet Pea, was about to call the mast done but now have to go back and add an SG. You always hear about Helena and Fletcher's SG use during the Bar Room Brawl, but never heard about Portland. radar contact with the enemy was reported by the U.S.S. Will anyone please confirm if USS PORTLAND had SG radar in November 1942? I am not sure if that's the SG radar at the foremast just below the SC radar. appeared to be a battleship. At least, this quote does prove that there was an SG radar on USS PORTLAND. In 42, Ma 11 and Ms 21 were really the same. 5-S was discontinued because it proved less than satisfactory. It was replaced with 5-N, which was later redesignated Ms 21. Ms11 is a possibility for early 42’, but by August and November she was for sure in Ms21. I will check my references for when she could have gone from ms11 to 21. She was also likely painted in Ms1 until her February refit. USS PORTLAND in November 1942. I appreciate for the response. Portland in Nov 42 is the real mystery. She definitively wore Ms 32/10d, but only pictures of her starboard side and from directly ahead are known to exist. What more would you like to know about her camouflage? There's really just one major area that I'm still having issues with for the CAD model. It concerns the series of windows on the flag bridge level that appear to trail aft. I'm not sure if they're actually windows, or are meant as transparent wind breaks, or perhaps both. I'd attach a photo but I'm on my work computer and unable to access Navsource (they blocked it as a suspicious site, seriously!). But, if you loo on the large, extended flag bridge level, the lowest one that just out the farthest from the centerline, you'll see a series of 5-6 windows. I simply can't figure out where they go. They do not appear to run straight from the flag bridge up to the navigation bridge wings as those wings are shaped differently. Are they internal? I can't tell. Any help GREATLY appreciated. Just realized there is a minor mistake in the Pontos instructions. The handrails on the tops of the funnel caps have been transposed. Part no's 84 & 85 should be switched. Didn't spot it when making up the first one, but noticeable on the second. Yes Steve, it looks like that. When I started to look at the real images, it reminded me of the old knife sharpening machines that were attached to bicycles that traders used when visiting remote villages and towns with! I looked at my set of Webb Warships Indianapolis plans last night. The "lump" is called out as an exhaust fan, which means the box with the door on the back is probably where the air exits when the fan is in operation. The entire area of the main deck forward of B barbette is shown as officer's quarters. The exhaust fan is located directly over the main officer's head and washroom. Thank you kindly for your swift and informative reply. I doubt that it is an escape hatch as there are three other hatches in the immediate area. It appears to be a cover over some piece of equipment, perhaps a ventilation fan, with an electrical box attached to the back, perhaps a control panel. 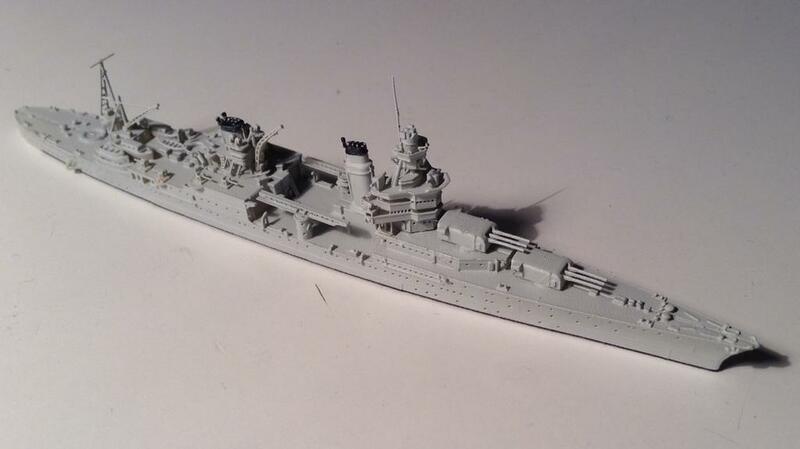 The attached photos show the object in question on the well-detailed Tehnohart model of the Indianapolis. Unfortunately the instructions give no clue as to what the object actually is.